At this time of year we receive many calls from colder climates asking us to help them combat ice dams. We offer this article posted last month by the Minnesota Better Business Bureau. It’s been quite a winter already, and we still have weeks to go before spring arrives. Many people in both Minnesota and North Dakota have had trouble with ice dams forming on their roofs or are still battling ice dams. The Better Business Bureau of Minnesota and North Dakota (BBB) is offering advice to homeowners on how to deal with this problem and protect their investment in their homes. 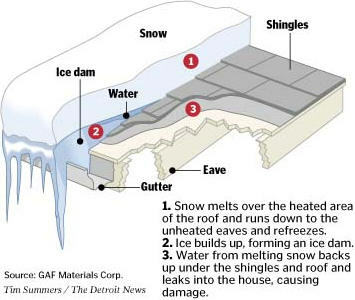 Ice dams are ridges of ice that form at the edge of a roof, preventing melting snow from draining off the roof. Melting occurs when warm air from indoors escapes through the attic and melts snow on the roof. That water can then leak into homes, damaging walls, ceilings and insulation. According to the University of Minnesota Extension Agency, summer is the best time to prevent ice dams – by increasing the ceiling insulation to cut down on heat loss, making ceilings airtight and/or adding natural roof ventilation. Plugging leaks and adding insulation can reduce energy use in homes by 20 to 30 percent. For homeowners currently contending with ice dams – or who are looking to avoid their formation – the BBB recommends using a snow rake to remove excess snow from the roof. However, even if care is taken, roofing materials may be damaged in the process. It is not advisable to get up on your roof to remove snow. Many people are injured each year trying to deal with this problem on their own. Sometimes it’s best to leave things to professionals. Check out the company’s record with the BBB at www.bbb.org or by calling 1-800-646-6222. Make sure the company has insurance and their workers are covered under workers’ compensation. Get estimates from multiple companies. Ask how much experience each company has working on roofs and ice dams, as well as what techniques they’ll be using to remove the ice dams. Less intrusive techniques may reduce potential damage to your roofing. Watch out for someone who pulls up in a truck and tells you they can ‘save you some money.’ Your roof is an integral part of your home and it’s not something you want to cut corners on. You’ll often end up regretting it. For more information on ice dams, how they’re formed and how to avoid them, visit http://www.extension.umn.edu/distribution/housingandclothing/dk1068.html.